BRIDGEPORT, Mich. – A national atheist activist organization has requested an investigation into what it calls a “flagrant violation of the First Amendment” after learning that coaches and players of a Michigan high school’s junior varsity football team circled up to pray with another team after a recent game. “This conduct is unconstitutional because coaches endorse and promote their own religion when acting in their official capacities as school district employees,” the Wisconsin-based Freedom From Religion Foundation (FFRF) wrote in a recent letter to the Bridgeport Spaulding School District. According to reports, after a junior varsity football game in Michigan between Bridgeport High School and Ogemaw Heights High School, players and coaches from both teams gathered together in the middle of the field to hear a few words from the Bridgeport head coach. One of the attendees that day, Ashley Miller, described in a Facebook post what happened next. Miller shared a photograph of the two teams kneeling in prayer in the middle of the field. Players from both teams can be seen kneeling together in a circle with their helmets removed and heads bowed. “That simple gesture brought both of our teams closer,” Miller wrote. Hundreds responded to Miller’s post by “liking” or sharing the photo and leaving comments of their own. “I think this is a wonderful,” one remarked. “This is a beautiful sight,” another said. However, when FFRF found out about the post-game prayer after a “concerned citizen” brought Miller’s Facebook post to their attention, it submitted a letter of complaint to the district superintendent. “It is illegal for public school athletic coaches to lead their teams in prayer,” wrote legal director Rebecca Markert. She argued that such a prayer is tantamount to an endorsement of religion and is therefore unconstitutional. 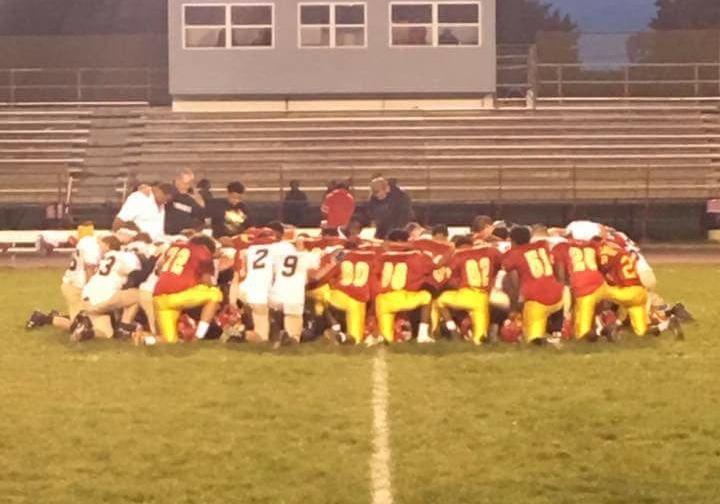 Although FFRF has expressed displeasure, others state that they support the post-game prayer. As previously reported, the FFRF has similarly accused school districts in Pennsylvania, Florida, and North Carolina of violating the U.S. Constitution by allowing prayers at football games.